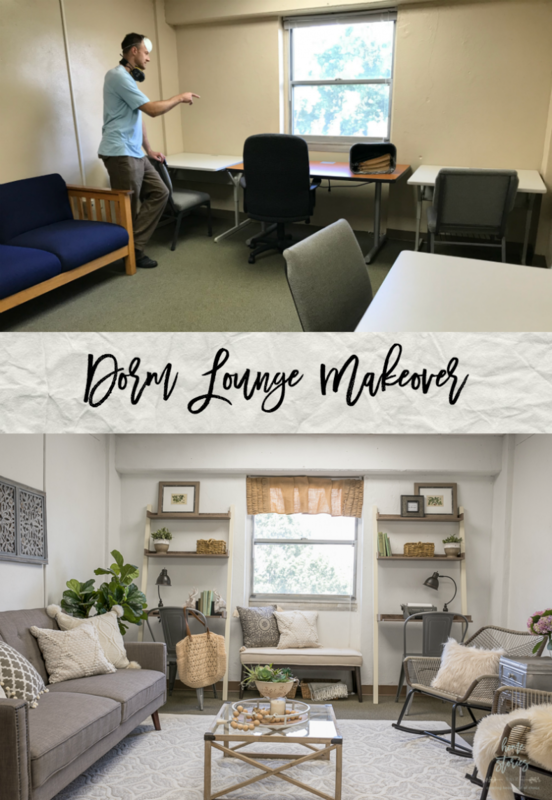 Come see this beautiful dorm lounge makeover! 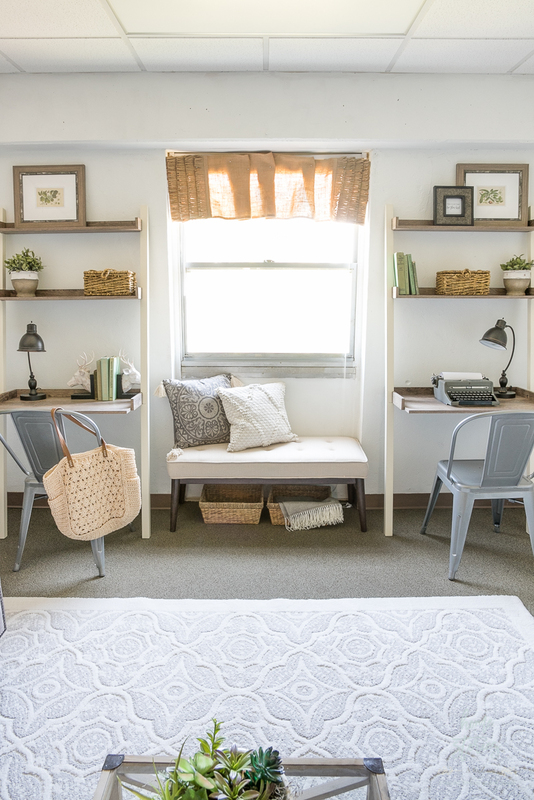 This ugly and drab dorm room was transformed into a beautiful and functional space using affordable products. 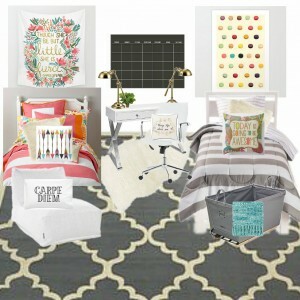 This post is sponsored by Better Homes & Gardens at Walmart and contains affiliate links. Jump to the end of the post to shop the products! a deserving part of our community using Better Homes & Gardens at Walmart products. I knew immediately who I wanted to serve for this month’s challenge and decided to use a portion of my own income to make this makeover a reality! My husband, Matt, works as a professor and director for a “gap year” program called OneLife at Southern Wesleyan University. OneLife is a Christian gap year program for students who want to grow in their faith, experience genuine community, serve others, and travel while earning college credits. The program is intense all the way around–physically, spiritually, emotionally, and academically. Matt has four staff members who live in the dorm and selflessly pour their lives into these college students with little to no time off! His staff desperately needs an “adult space” within the dorm where they are free to escape, nap, hang out, work, and entertain. Here is their drab lounge area before. And drum roll, please…here is the beautiful AFTER! Oh my goodness, isn’t it so much better? I love the way it turned out. Let’s dive into all of the delicious details and learn how to replicate this design for yourself! Inviting space to welcome in others. Place to sit, read, and drink coffee. Cozy and warm place to meet with small groups. Place to work on laptop. Gender neutral space where everyone feels welcomed. Welcoming and peaceful gathering area. 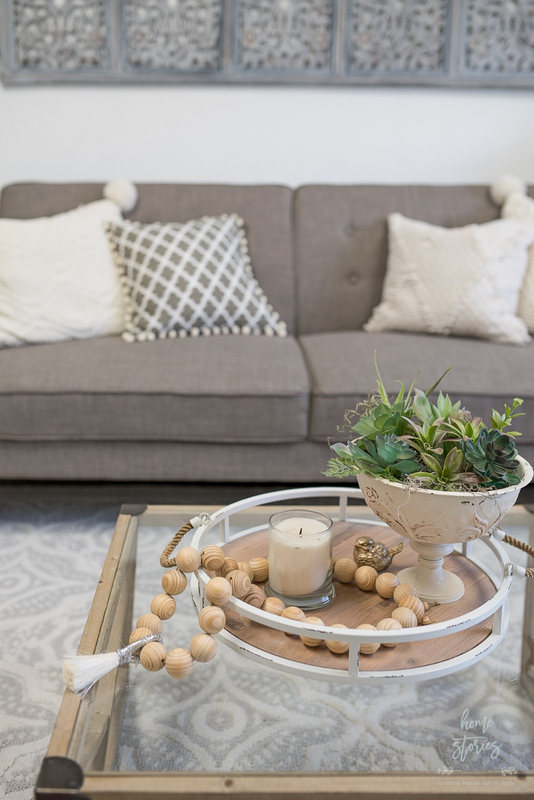 Pro-Shopping Tip: While you can always find Better Homes & Gardens products in Walmart stores, there is an extended and vast assortment of products online at walmart.com/bhg. More styles, colors and sizes are only a click away, so be sure to visit the site. Also, you can often save on freight charges and some shipping costs on larger items by choosing the “ship to store” option at checkout. Armed with my bullet list of wishes, I set off to search online for Better Homes & Gardens at Walmart products that would complement my general design plan. 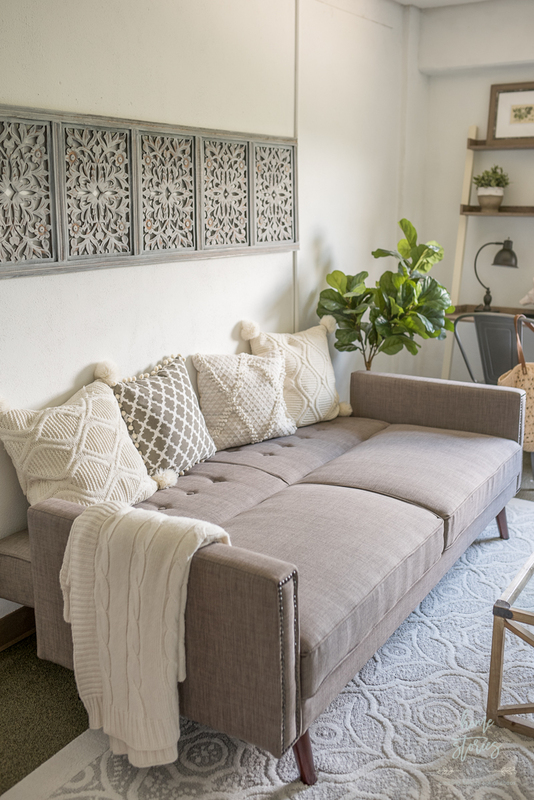 I knew I wanted the room to be soft, neutral, and a little boho-chic. 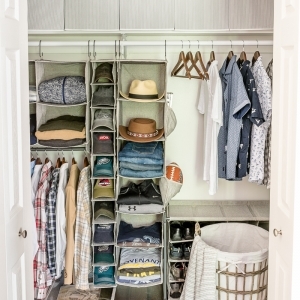 It’s always a good idea to source your larger items first before filling in with smaller accessories. 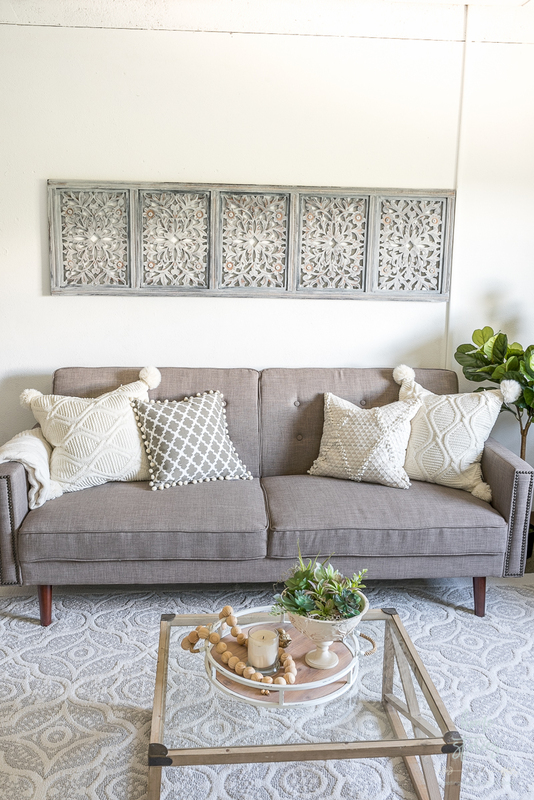 I found this gorgeous and incredibly affordable 8×10, Better Homes & Gardens Blooming Quatrefoil Area Rug which set the color palette for the space. It’s very comfy underfoot and as I type this (prices subject to change) is priced at only $150! My next purchase was this amazing Rowan Linen Futon Sofa. It’s perfect for the space and folds down for naps or simply sprawling out. 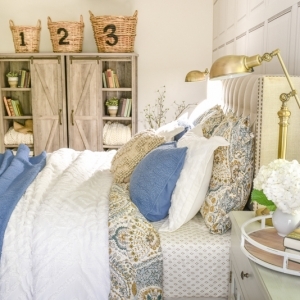 The fabric is soft and I love the tufting and nailhead trim details. My only complaint is that the fabric does wrinkle a bit after sitting and needs to be smoothed. 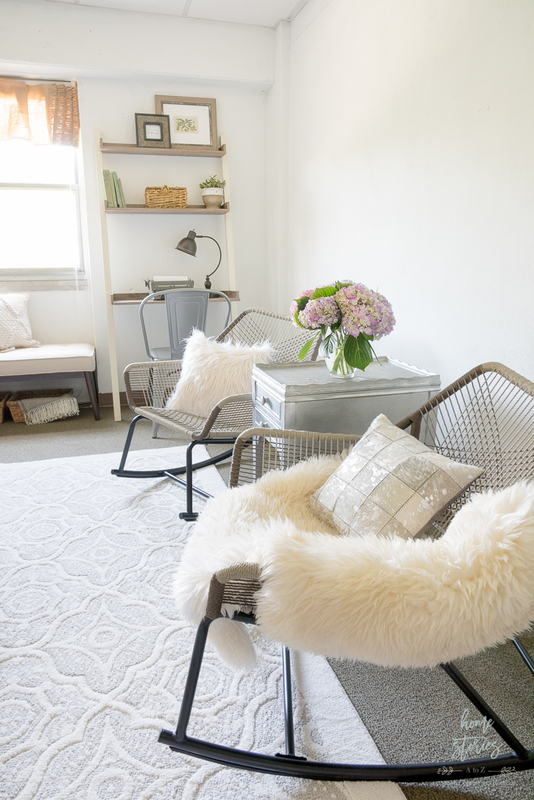 I love the boho-chic look of hanging chair swings, macrame wall tapestries, and floor poufs. 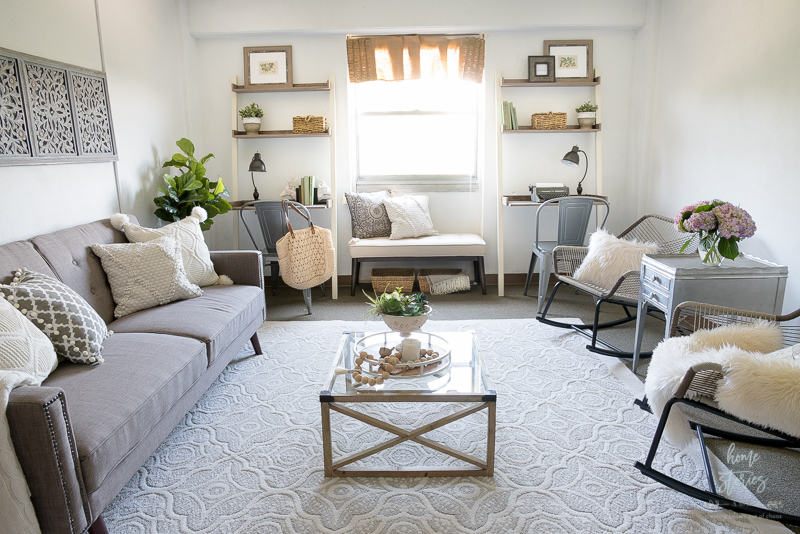 I wanted to bring in something slightly unexpected and youthful to the room and fell in love with the Better Homes & Gardens Satilla Outdoor Rocking Chairs. 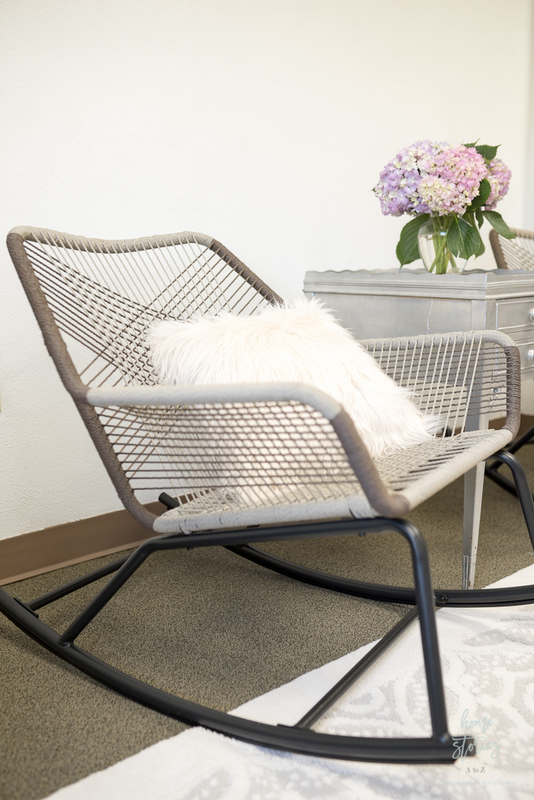 While originally intended for outdoor use, the woven chair design with black metal legs looks cozy and beautiful indoors. These rockers brought exactly the right amount of modernity to the room that I was craving! 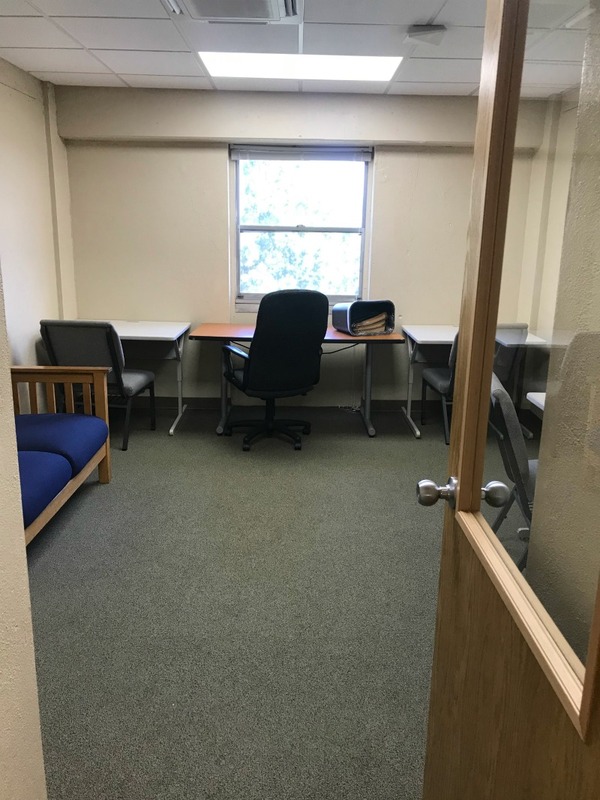 While creating a place to work, sit, read, and have coffee, I also wanted to be sure that the staff had desk areas to check email, write, or draw. 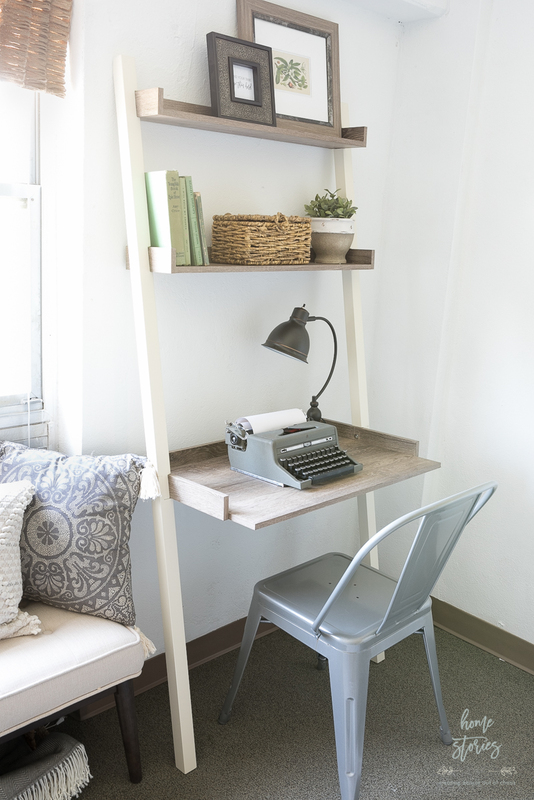 The Better Homes & Gardens Bedford Leaning Desks are perfect! 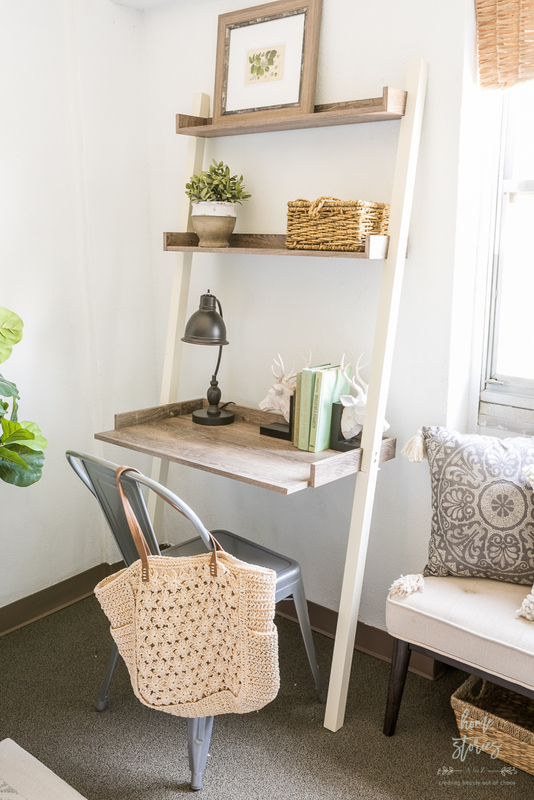 The shelves provide places for books and accessories while the desk area provides ample space for a laptop or tablet. 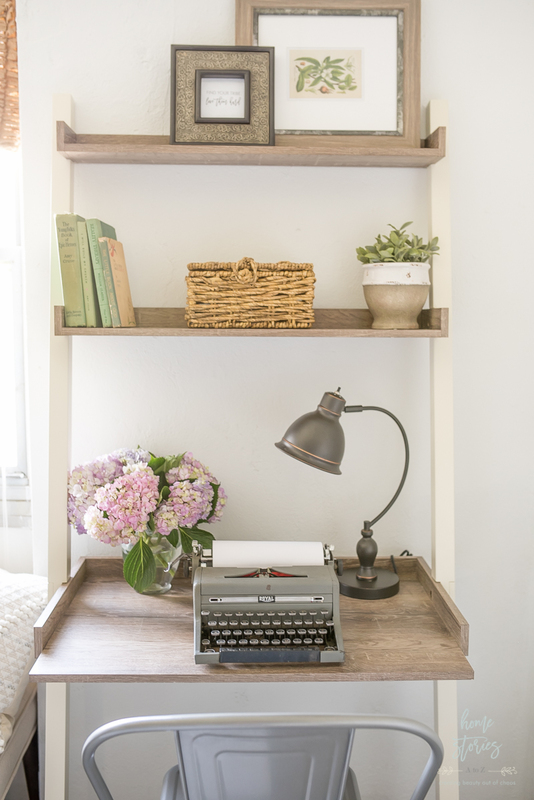 The cute Better Homes & Gardens Traditional Desk Lamps look adorable on the desks and provide additional task lighting. On the shelves, I used some accessories I had on hand including these adorable planters! I brought in the shelf accessories simply for staging and will let the staff decorate the shelves with their own items later. 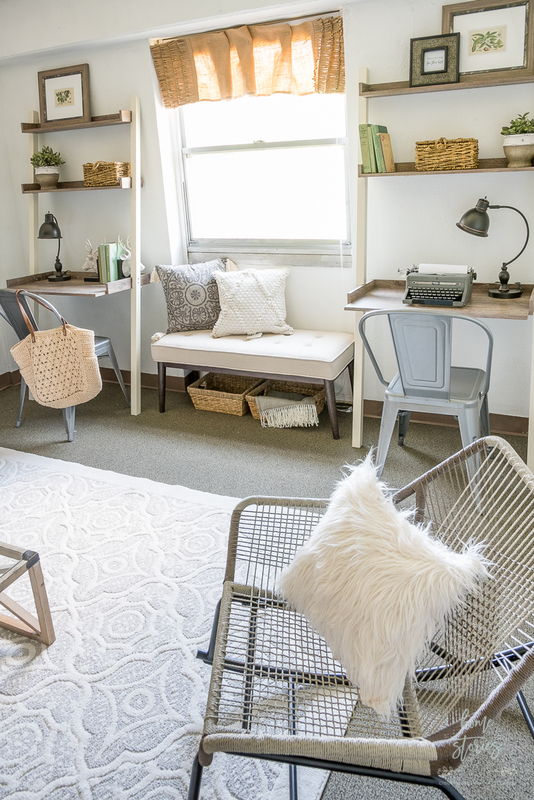 Creating flexible seating in this space was a priority. The staff often meets with small groups of students for heart-to-heart talks. 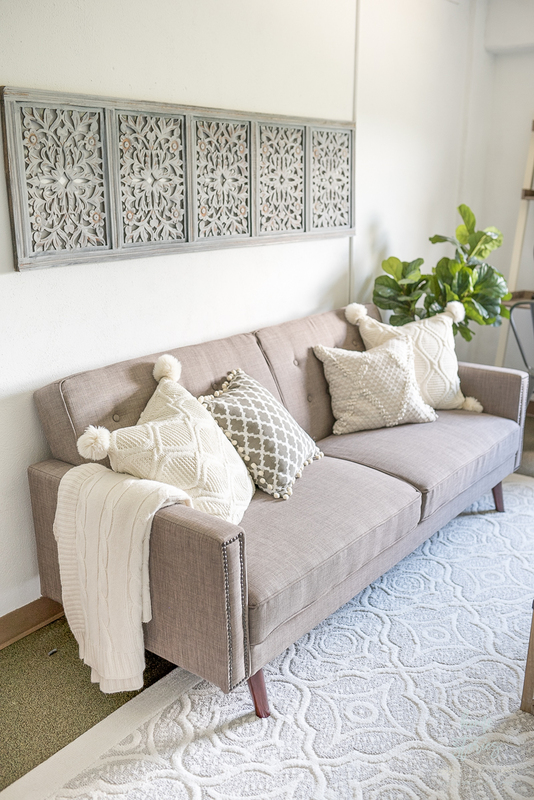 I bought the Better Homes & Garden Colton Bench to fit as a window seat and it can easily be moved around the room as needed. The desk chairs are the Better Homes & Gardens Camrose Farmhouse Stacking Café Chairs. They are the same ones I used in my patio makeover and in my boys’ media room makeover. They stack up when not in use and are lightweight. I am very proud of how this room turned out! For all of the source links, please see below and click on the products you are interested in shopping. Thanks for stopping by and feel free to pin my pictures to Pinterest before you go! Beth this before & after is incredible! I bet the kids are SO happy with the change.. what a relaxing space. What are the wall hangings behind the futton? This would look super in my son’s room. I needed something quick to put up on the wall since the staff will be placing their own artwork up at a later date. I had this odd wood piece in our attic and just gray-washed it with some watered down chalk paint to create the look I wanted. This is such a great room! I love it! I’m going to look into the couch and chairs for our basement remodel! Thank you! I love the futon! It’s a beautiful tweed fabric and is comfy to sit on and easy to recline. 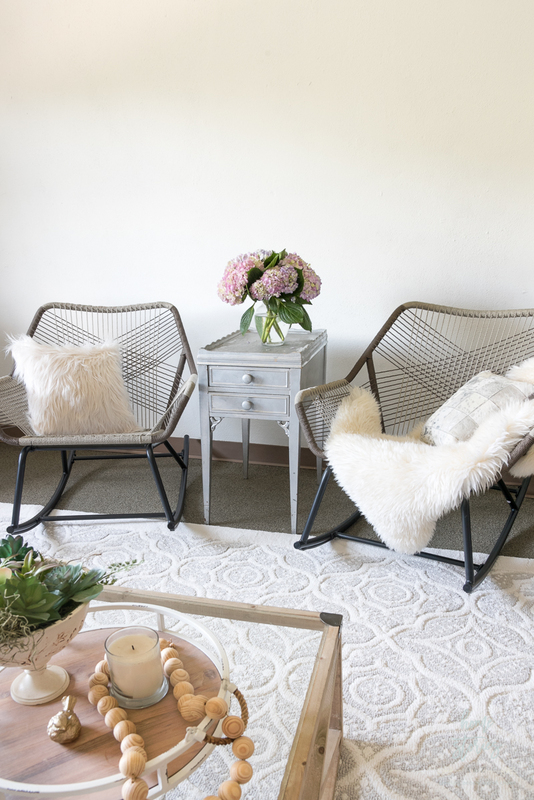 The rocking chairs are definitely comfier with the sheepskin throw. They sit a bit lower than I expected but the staff love them and they definitely add some texture and fun to the room. It’s lovely. But clearly NOT gender neutral. The colors are nuetral. The styling is not. Thank you so much! 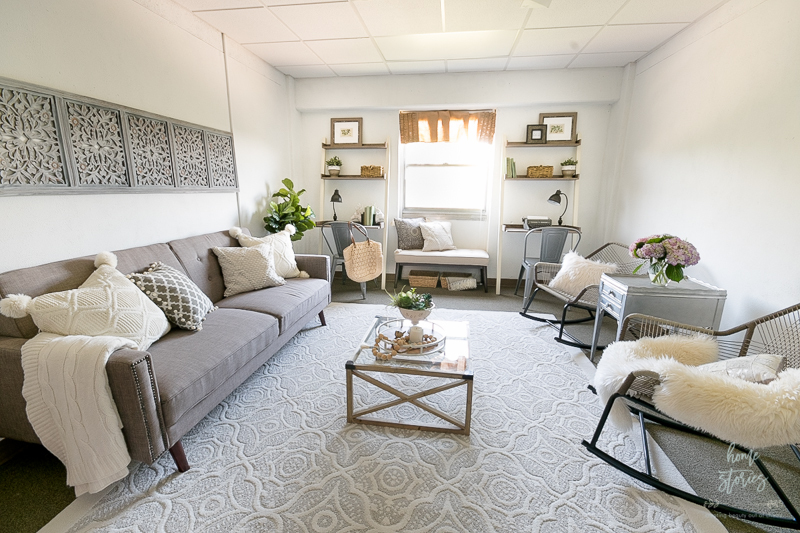 They absolutely loved the layout and all of the new furniture and were thrilled with the space! I did mention this in my post, but maybe it wasn’t clear. The styling was for the blog post and was to my taste. I brought things from home in order to take pics and have something on the shelves. This is their space and they will be styling it to their own taste with their own accessories and artwork. Room looks AMAZING!!! 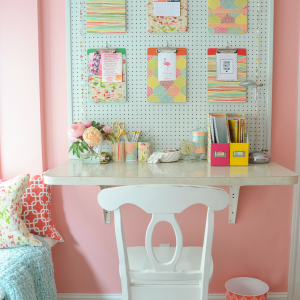 Going to measure my office/ guest room for those desks…. love them!! Thank you! The desks are amazing and so simple in design! I love them too.